More than 20 cases of the life-threatening bacterial infection leptospirosis have been reported in Detroit-area dogs in the past three weeks, according to Michigan State University’s Diagnostic Center for Population and Animal Health. by sniffing this urine or by contacting standing water that becomes contaminated by rain and water runoff. Please Help Us, Help Baby Girl! in the trenches everyday caring for our animals. Please take a moment to read Baby Girls story and consider helping us help them through this difficult time. As a side note: Baby Girl was rescued by one of our favorite horse rescues, Beauty’s Haven Farm and Equine Rescue. Beauty’s Haven reached out to us and we are reaching out to you… Here is her story. Baby Girl is a 2 year old stunted Quarter horse filly that sustained blunt trauma to her skull 2+ months before arriving at our rescue that went untreated. 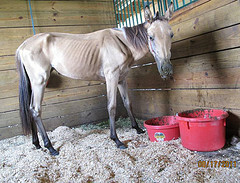 When she arrived at BHFER she looked like a very sick weanling and was skin on bones, weighing less than 300 lbs. She couldn’t chew food and needed a special soft diet. She had a very bad infection coming out of an open hole in her head between her ear and her eye, there were open wounds under her jaw, she had significant nerve damage on the right side of her face which was also scalded, and she couldn’t see out of her right eye. However, the infection has remained relentless. A CT scan done at the University of Florida this past week revealed a large bone fragment and a part of another bone that are infected that need to be removed ASAP. The infected fragment is close to the bone around her brain – the infection kills bone and she needs surgery. If the infection makes its way to the brain we will lose her. From Theresa: (Owner of BHFER) Baby Girl has a positive and powerful energy about her. She has much love and life in her eyes. When she runs, bucks and plays, she does so with such determination one can’t help but to smile and laugh – especially knowing what she has endured. The fact that she survived 2+ months with the injury, without proper treatment, before finding her way to us speaks volumes. When Theresa (owner of BHFER) treats her injury she stands there – most of the time without even a halter. I’m sure she knows we are helping her. And to watch her knock on the feed room door when it is feeding time, well, it tells us what time of the day it is and we smile. While there are odds stacked against her we believe she has the will and the ability to make it. We simply keep the faith and believe. When you believe, miracles can happen. We’ve seen many here at Beauty’s Haven and we hope to see more. The $2200. needed for Baby Girls surgery has been raised. 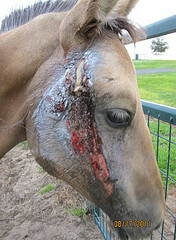 We are now working on raising funds for her expensive medicine and aftercare needs. Based on cultures done at UF she has been started on a different antibiotic that she will need for at least 8 weeks at a cost of $30.00 per day. The antibiotic is expensive BHFER is trying to have some of those antibiotics donated. BHFER currently has enough of the antibiotic to get Baby Girl through a week. Animal Fairy Charities is a 501c3 non profit organization fostering national & international prevention of cruelty to all animals and aiding in their safety & welfare. Our core mission is to raise and distribute funds in support of the missions of other animal non-profit organizations using a federated (i.e. United Way) method. In addition, Animal Fairy Charities educates and engages young children in compassion through the positive interaction with animals. Tax deductible donations are always appreciated to help fund our mission. Because of our donors, we can continue our work to help animals. Thank you again for your time and your care for our animals. teach children compassion at an early age. Animal Advocate Television also honors and pays tribute to our animal caregivers while educating viewers on what these caregivers experience day to day as they strive to give our animals the respectable quality of life they deserve. Our pet health and medical segments are standard with each new season to keep our viewers updated on the latest in pet/animal fitness and well-being. Television signifies all there is for our companion animals. being linked to a domestic abuse shelter, confidentiality is critical. Why volunteer to house an animal? hurt or killed their animal (Ascione, Weber and Wood, 1997). situations out of concern for their animal’s safety (McIntosh, 2002). families and their animals is vitally important. 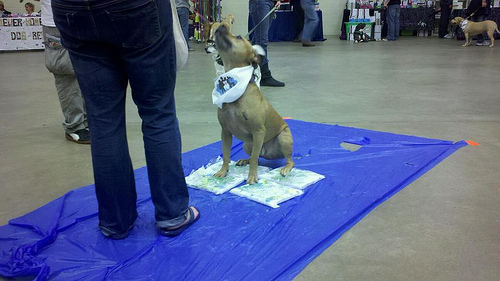 HAWS,the Humane Animal Welfare Society of Waukesha County, has a full weekend of fundraising, learning and adoption events, with proceeds benefitting the shelter’s animal care services and educational programs. HAWS’ Fashion for Paws fundraiser is Friday, October 14, from 5 – 8pm at Silver Spring Country Club, N56 W21318 Silver Spring Drive. This cocktails and appetizers event features a runway show with fashions from local boutiques, auctions, a raffle and adoptable pets from HAWS. Waukesha. Find a new furry, fluffy or feathered family member while enjoying music and food; Saturday from 9am – 2pm and Sunday from 10am – 2pm. Also on Saturday, get into the Halloween spirit at the annual Waukesha Zombie Walk in downtown Waukesha, beginning at 3pm. Every zombie is required to bring at least 3 supply items, or $2, for HAWS or the Waukesha Food Pantry. There are 3 routes to walk, all ending at the gazebo on Bank Street by 5:30pm. shelter. This free event includes guest speakers, shopping for cavie supplies, raffles, door prizes and guinea pig contests. Owners and their guinea pigs, as well as those interested in learning more, are welcome to attend. Bully Club and Elmbrook Humane Society. from these paintings will benefit Animal Fairy Charities. more about Hector, you can log onto www.hectorthepitbull.com or www.facebook.com/hectorthepitbull . Bark-Away’, this year benefiting our own local Capital K9s. here to make a difference in the lives of our Capital K9s. $10.00 door donation will provide guests with a night full of howling fun. treats. Come and celebrate Howl-O-Ween and support Capital K9s! 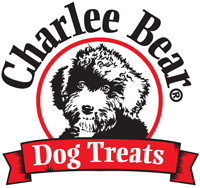 Charlee Bear Products, creator of all-natural, low calorie, Charlee Bear® Dog Treats since 1995, has teamed up with Dogbook, the virtual and mobile social network for dog lovers, and Guide Dogs of America, for the first web-based “Dogs Helping Dogs” charity giveaway. Kicking off Oct. 1, Charlee Bear will donate 10 treats to Guide Dogs of America for every new user that joins Dogbook at https://apps.facebook.com/dogbook, with an ultimate goal of donating 100,000 treats. Guide Dogs of America places and trains over 50 highly-skilled assistance dogs each year, transforming the lives of the people they live with. Dogbook is the world’s largest social network for dogs and dog owners. You can keep track of your dog’s life by uploading photos of their adventures, posting daily status updates for your dog, and searching breeds and parks nearby. With an iPhone app and a soon to be launched iPad app, it’s the perfect place for dogs and people who love dogs. Dogbook’s goal is “to do right by dogs and dog lovers,” co-founder Alexandre Roche says. “This giveaway empowers our users to give back to a great cause.” Featured on ABC, CBS, Fox News, and The New York Times, Dogbook boasts over 3.5 million members. Charlee Bear Dog Treats come in four flavors, are known as a healthy, low-calorie snack, and are ideal for training and anytime rewards. They are available at pet supply retail stores nationwide and in Canada. Only three calories per piece means you can train your dog without giving lots of additional calories. Trainers recommend these treats and dogs enjoy them. All-natural and made in the United States, Charlee Bear is a leader in the world of healthy dog treats. Charlee Bear, Dogbook, and Guide Dogs of America is a natural partnership for the first “Dogs Helping Dogs” charity giveaway. To learn more, visit https://apps.facebook.com/dogbook/charlee-bear. For more information, contact Charlee Bear Products at (800) 880-2327, visit www.CharleeBear.com, visit www.facebook.com/CharleeBear, or e-mail info@CharleeBear.com.